"Reach Out I'll Be There" (also formatted as "Reach Out (I'll Be There)") is a song recorded by the Four Tops from their fourth studio album Reach Out (1967). Written and produced by Motown's main production team, Holland–Dozier–Holland, the song is one of the best known Motown tunes of the 1960s, and is today considered The Tops' signature song. It was the number one song on the Rhythm & Blues charts for two weeks, and on the Billboard Hot 100 for two weeks, from October 15–22, 1966. It replaced "Cherish" by The Association, and was itself replaced by "96 Tears" by Question Mark & the Mysterians. The track also reached number one in the UK Singles Chart, becoming Motown's second UK chart-topper after The Supremes' 1964 release "Baby Love". It replaced Jim Reeves' "Distant Drums" at number one in October 1966, and stayed there for three weeks before being replaced by The Beach Boys' "Good Vibrations" in November. Rolling Stone later ranked this version number 206 on its list of "The 500 Greatest Songs of All Time". Billboard ranked the record as the number four song for 1966. This version is also currently ranked as the 56th best song of all time (as well as the number four song of 1966) in an aggregation of critics' lists at Acclaimed Music. Lead singer Levi Stubbs delivers many of the lines in the song in a tone that some suggest straddles the line between singing and shouting, as he did in 1965's "I Can't Help Myself (Sugar Pie Honey Bunch)". AllMusic critic Ed Hogan praises Stubb's vocal, as well as the song's "rock-solid groove" and "dramatic, semi-operatic tension and release." Critic Martin Charles Strong calls the song "a soul symphony of epic proportions that remains [the Four Tops'] signature tune." Eddie realised that when Levi hit the top of his vocal range, it sounded like someone hurting, so he made him sing right up there. Levi complained, but we knew he loved it. Every time they thought he was at the top, he would reach a little further until you could hear the tears in his voice. The line "Just look over your shoulder" was something he threw in spontaneously. Levi was very creative like that, always adding something extra from the heart. 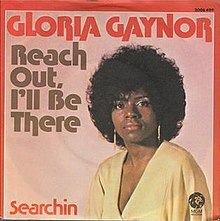 (1974) "Reach Out, I'll Be There"
"Reach Out, I'll Be There" was covered by Gloria Gaynor in 1975. It was the third of three singles released from her LP Never Can Say Goodbye. Gaynor's version of "Reach Out, I'll Be There" became an international hit. It reached number 60 in the U.S. and number 16 in Canada. It did best in Europe, where it reached number 14 in the UK and number five in Germany. ^ a b Rice, Jo (1982). The Guinness Book of 500 Number One Hits (1st ed.). Enfield, Middlesex: Guinness Superlatives Ltd. p. 105. ISBN 0-85112-250-7. ^ a b Gilliland, John (1969). "Show 50 – The Soul Reformation: Phase three, soul music at the summit. [Part 6]" (audio). Pop Chronicles. University of North Texas Libraries. ^ "All The Number One Singles 1966". Official Charts Company. Retrieved March 18, 2014. ^ a b "Top 100 Hits for 1966". The Longbored Surfer. Retrieved July 15, 2014. ^ "The All Time Top 6000 Songs". Acclaimed Music. Archived from the original on July 10, 2017. Retrieved July 14, 2014. ^ "The Top Songs from 1966". Acclaimed Music. Retrieved July 14, 2014. ^ "Reach Out (I'll Be There) – Song Review". AllMusic. All Media Network. Retrieved July 14, 2014. ^ Strong, Martin Charles (2004). The Great Rock Discography. Canongate. p. 556. ISBN 978-1-8419-5615-2. ^ Simpson, Dave (April 7, 2014). "The Four Tops: how we made Reach Out (I'll Be There)". The Guardian. Retrieved December 16, 2014. ^ "Forum – ARIA Charts: Special Occasion Charts – CHART POSITIONS PRE 1989". Australian-charts.com. Hung Medien. Retrieved July 15, 2014. ^ "Ultratop.be – The Four Tops – Reach Out I'll Be There" (in Dutch). Ultratop 50. Retrieved July 15, 2014. ^ "Top RPM Singles: Issue 5729." RPM. Library and Archives Canada. Retrieved July 15, 2014. ^ "The Irish Charts – Search Results – Reach Out I'll Be There". Irish Singles Chart. Retrieved July 15, 2014. ^ "Indice per Interprete: F" (in Italian). Hit Parade Italia. Creative Commons. Retrieved July 15, 2014. ^ "Nederlandse Top 40 – 4 Tops - Reach Out I'll Be There" (in Dutch). Dutch Top 40. Retrieved July 15, 2014. ^ "Dutchcharts.nl – The Four Tops – Reach Out I'll Be There" (in Dutch). Single Top 100. Retrieved July 15, 2014. ^ "Search listener". Flavour of New Zealand. Retrieved August 11, 2017. ^ "Official Singles Chart Top 100". Official Charts Company. Retrieved July 15, 2014. ^ a b "The Four Tops – Awards". AllMusic. All Media Network. Retrieved July 15, 2014. ^ "CASH BOX Top 100 Singles – Week ending OCTOBER 15, 1966". Archived from the original on October 4, 2012. . Cash Box. ^ "100 Top Pops" (PDF). Record World. October 15, 1966. p. 19. Retrieved September 9, 2017. ^ "Offiziellecharts.de – The Four Tops – Reach Out I'll Be There". GfK Entertainment Charts. Retrieved February 28, 2019. To see peak chart position, click "TITEL VON The Four Tops"
^ "The Irish Charts – Search Results – Reach Out". Irish Singles Chart. Retrieved July 15, 2014. ^ "[1988&cat=s Charts.nz – The Four Tops – Reach Out I'll Be There "]. Top 40 Singles. Retrieved July 15, 2014. ^ "Top RPM Adult Contemporary: Issue 1793." RPM. Library and Archives Canada. Retrieved July 15, 2014. ^ "Jaaroverzichten 1966" (in Dutch). Ultratop. Hung Medien. Retrieved July 15, 2014. ^ "Top 100-Jaaroverzicht van 1966" (in Dutch). Dutch Top 40. Retrieved July 15, 2014. ^ "The CASH BOX Year-End Charts: 1966". Archived from the original on October 4, 2012. . Cash Box. ^ "The RPM Top 100 A\C Tracks of 1993". RPM. Vol. 58 no. 23. Library and Archives Canada. December 18, 1993. Retrieved July 15, 2014. 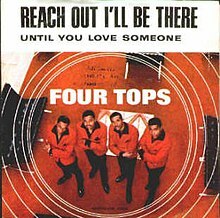 ^ "British single certifications – Four Tops – Reach Out I'll Be There". British Phonographic Industry. Retrieved March 1, 2019. Select singles in the Format field. Select Silver in the Certification field. Type Reach Out I'll Be There in the "Search BPI Awards" field and then press Enter. ^ "American single certifications – The Four Tops – Reach Out, I'll Be There". Recording Industry Association of America. Retrieved March 1, 2019. If necessary, click Advanced, then click Format, then select Single, then click SEARCH. ^ "Forum – ARIA Charts: Special Occasion Charts – CHART POSITIONS PRE 1989, part 2". Australian-charts.com. Retrieved August 6, 2018. ^ "Austriancharts.at – Gloria Gaynor – Reach Out, I'll Be There" (in German). Ö3 Austria Top 40. Retrieved August 6, 2018. ^ "Ultratop.be – Gloria Gaynor – Reach Out, I'll Be There" (in Dutch). Ultratop 50. Retrieved August 6, 2018. ^ "Top RPM Singles: Issue 3962a." RPM. Library and Archives Canada. Retrieved August 6, 2018. ^ "Nederlandse Top 40 – week 16, 1975" (in Dutch). Dutch Top 40 Retrieved August 6, 2018. ^ "Dutchcharts.nl – Gloria Gaynor – Reach Out, I'll Be There" (in Dutch). Single Top 100. Retrieved August 6, 2018. ^ "South African Rock Lists Website SA Charts 1969 – 1989 Acts (G)". Rock.co.za. Retrieved August 6, 2018. ^ "Official Singles Chart Top 100". Official Charts Company. Retrieved August 6, 2018. ^ a b c "Gloria Gaynor – Awards". AllMusic. Archived from the original on March 2, 2016. ^ "CASH BOX Top 100 Singles – Week ending APRIL 12, 1975". Cash Box. Archived from the original on October 3, 2012. ^ "Offiziellecharts.de – Gloria Gaynor – Reach Out, I'll Be There". GfK Entertainment Charts. Retrieved 1 January 2018. To see peak chart position, click "TITEL VON Gloria Gaynor"
^ "Jaaroverzichten 1975" (in Dutch). Ultratop. Hung Medien. Retrieved August 6, 2018. ^ "1975 Wrap Up". RPM. Vol. 24 no. 14. December 27, 1975. Retrieved August 6, 2018. ^ "Jahrescharts – 1975". Offiziellecharts.de (in German). GfK Entertainment Charts. Archived from the original on May 9, 2015. ^ "Top 100-Jaaroverzicht van 1975" (in Dutch). Dutch Top 40. Retrieved August 6, 2018. ^ "Jaaroverzichten – Single 1975" (in Dutch). Single Top 100. Hung Medien. Retrieved August 6, 2018. This page was last edited on 1 March 2019, at 19:02 (UTC).